Complete streets design is defined as roadway design features that accommodate and facilitate convenient access and mobility by all users, including current and projected users, particularly pedestrians, bicyclists, transit users, and individuals of all ages and abilities. Complete streets may also play a role in making a community healthier, reducing transportation impacts on the environment, and leading to private investment in a corridor. The city's prompt to develop the manual was a 2013 complete streets ordinance that included a provision for the city to adopt a manual to guide its efforts. 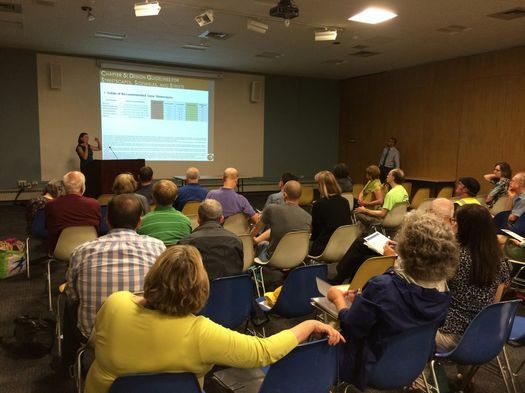 The city hired MJ Engineering and Land Surveying to develop the manual, and planners from the firm presented the doc at the public meeting at the Albany Public Library on Wednesday. "We think all of this is about quality of life," said Chris Spencer, the city's planning director after the meeting. "So every time you think about a street, think about the walkability, think about the bikeability, think about people with different abilities in terms of their mobility. The more transit routes you have, the more buses, then the less space you have to devote to parking and parking lots. And the less land use you have for all of those, the more land use you have for buildings and dynamic, exciting uses that make a vibrant city. So it fits together with our ReZone [Albany project], with our comprehensive plan. It's just a different way of looking at it -- we're looking at it on a different level." A sample arrangement for a downtown street. There's a bigger version above in large format. 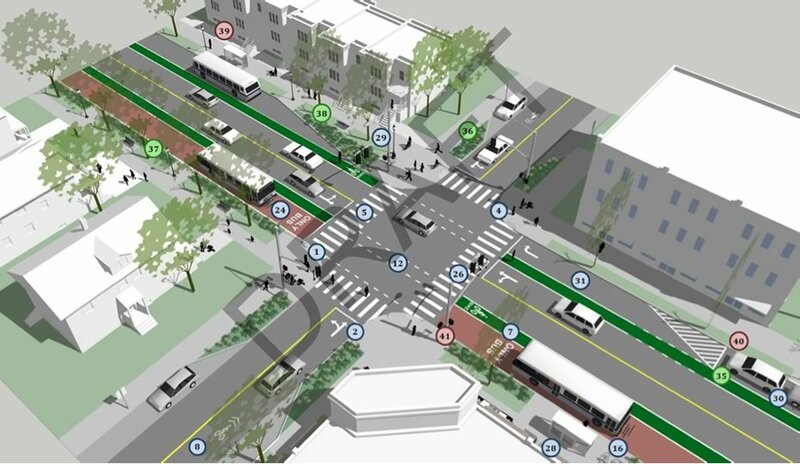 There's a lot of attention in the guide to amenities for bikes and transit -- everything from different flavors of bike lanes to transit-only lanes for a bus rapid transit system such as BusPlus (starting at pdf p. 66). 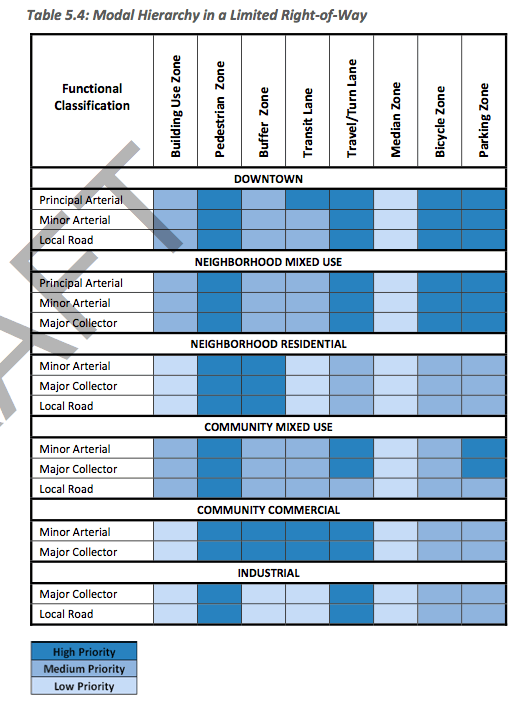 If you're interested in these sorts of amenities, you'll also probably want to take a look at table that matches preferred street elements with types of neighborhood and width of street (pdf p. 72 -- it's also above in large format). For example: the "Neighborhood Mixed Use" neighborhood type -- Madison Ave in Pine Hills is shown as an example earlier in the manual -- has buffered and striped bike lanes as preferred elements, but not protected bike lanes. The topic of protected bike lanes on Madison Ave was a major point of discussion in the Madison Road Diet plan (the city ultimately did include bike lanes, but not the protected variety). So it'll be interesting to see if this matchup of street elements and types of streets will prompt feedback from the public. 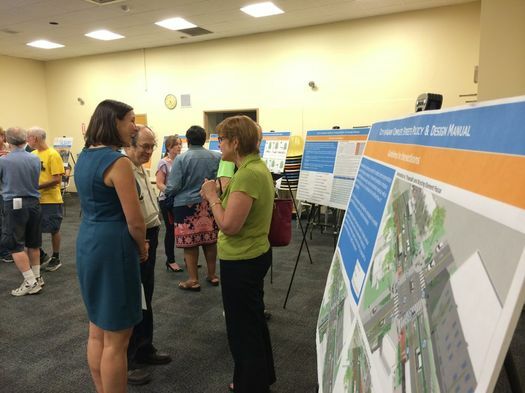 At the public meeting Wednesday, Leah Golby -- the Albany Common Council member who sponsored the complete streets ordinance in 2013 after a pedestrian was seriously injured at Madison Ave and Ontario St -- said she will be looking over these sorts of details. 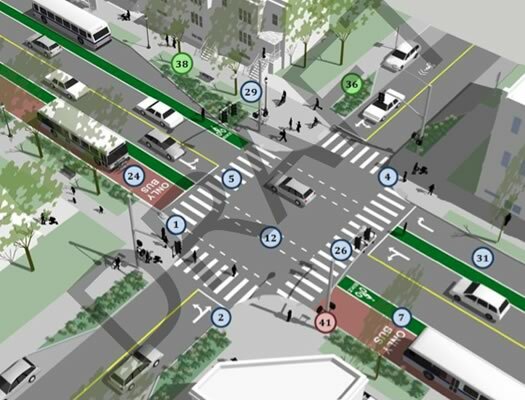 "That's something that I certainly will consider commenting on and asking for changes," she said with regard to which types of streets the plan says should be considered for protected bike lanes. "Because I think there is room even on the not-quite-as-wide for that type of treatment." Not every kind of amenity -- whether it be for pedestrians, bikes, transit, or cars -- is going to fit on every street because of space. And there is, of course, always the issue of cost. So one of the elements of the guide is laying out a hierarchy of priorities (pdf p. 87). For example: A pedestrian zone (that is, a sidewalk) is a high priority for every type of street across every type of neighborhood. 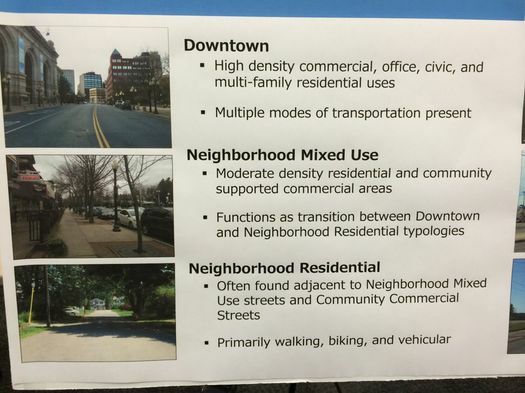 But a transit-only lane is high priority for major streets in downtown and commercial neighborhoods, a low priority in industrial zones and neighborhood residential areas, and a medium priority for the streets in other neighborhood types. 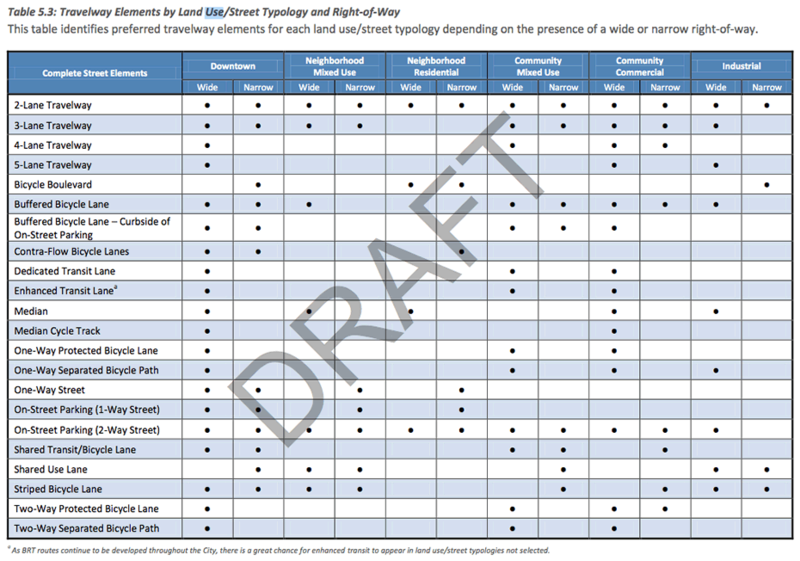 The city's complete streets ordinance gives the city a lot of latitude -- in fact, it doesn't require the city to actually implement any of the elements in the guide. So follow-through is going to be something to keep an eye on. "Part of it is having a proactive approach," Chris Spencer, the city planning director, said to us Wednesday when we asked about folding these ideas into actual projects. "Now we've got a manual. So when we look at the paving for the next year, we start to plan these projects a little bit more proactively. Whereas right now we didn't have this manual so you're starting to react to different interest groups that want different things on the streets. So this is really taking everybody's perspective and creating more of a planning and design process as much as we can. But also factoring into it what the realities are for the type of street that you have and the budget that we have for each project." So, in a way, the city's complete streets guide is like a public acknowledgement of what's possible. And if the city ends up needing a reminder of these possibilities, officials and the public will have a specific place to point.